Bon voyage, Mullany mural No. 2! Local artist, Tom Mullany hosted a viewing and send-off party for a recently completed mural for The Winery at Bull Run, slated to open in June. 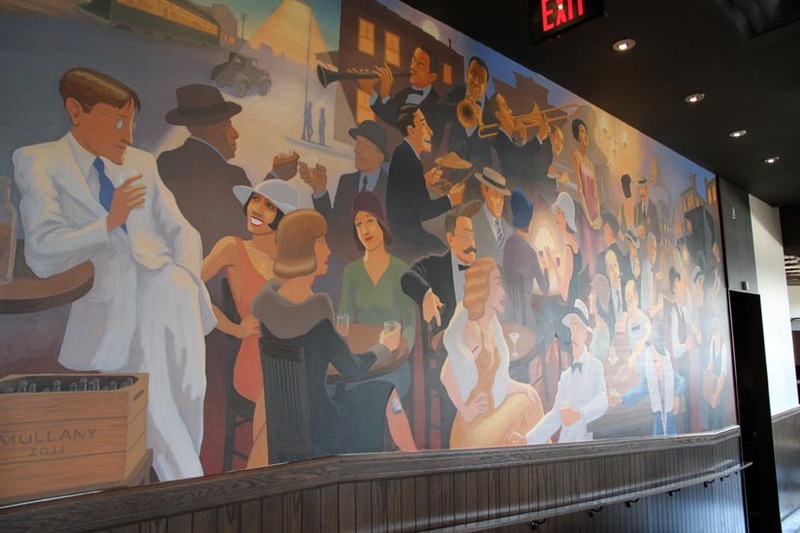 This is the second major mural that Mullany’s completed this year at Bruce Vierling’s warehouse in Flint Hill, which has great accommodations for projects of this size. The mural (6 feet by 20 feet, oil on canvas) portrays the morning of the First Battle of Bull Run, as picnickers are arriving from the city and some fighting has just begun on distant hills and fields. The majority of the scene depicts beautiful farmland as it might have looked before the war ravaged it. The painting was dry enough this week to remove from its stretcher and carefully rolled onto a large cylinder to be shipped to the winery, near the center of Manassas Battlefield Park, where it will be permanently affixed to the main wall of the tasting room.